On March 30th, 2012, the CPSC, in cooperation with Happy Shirts of Honolulu, Hawaii, announced a voluntary recall of their battery operated toy trucks, which were sold as gifts with purchase of their boy’s T-shirts at Kohl’s, due to a fire hazard. This recall involves approximately 9000 Big Movers Super Car toy trucks that were sold as gifts exclusively at Kohl’s stores nationwide with the purchase of Big Movers t-shirts between February 2012 and March 2012 for about $20. The 4-inch long blue trucks have oversized tires and a flashing light on top and were sold with a yellow, red and blue logo on the hood. 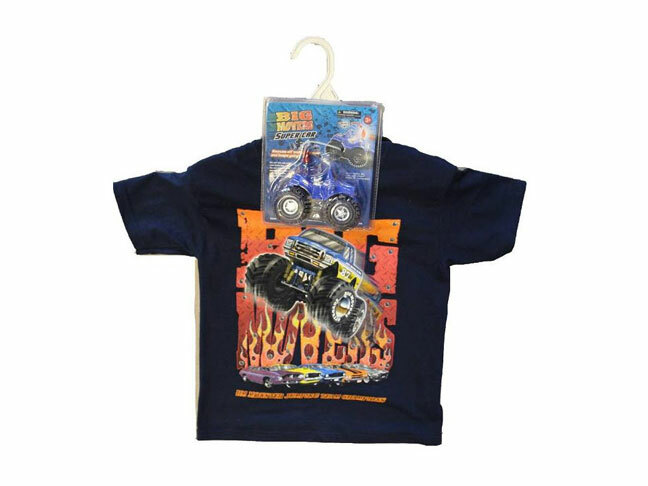 The navy t-shirts were sold in boys’ sizes S, M and L.
Connections in the toy trucks battery compartment can smolder or catch the trucks on fire, posing a fire and burn hazard to consumers. These products were manufactured in China. As of March 30th 2012, Happy Shirts has received one report of a toy truck catching fire and three reports of toy trucks smoldering when batteries were inserted, but no injuries have been reported yet as of this date. Consumers should immediately take the toy trucks away from children and remove the battery. Consumers can contact Happy Shirts for instructions on returning the truck for a refund. For additional information, please contact Happy Shirts toll-free at (855) 354-2779 between noon and 8 p.m. PT (9 a.m. to 5 p.m. HT) Monday through Friday or visit the firm’s website.